My work explores the expressive possibilities of glass through variation in color, texture, light, and atmosphere. 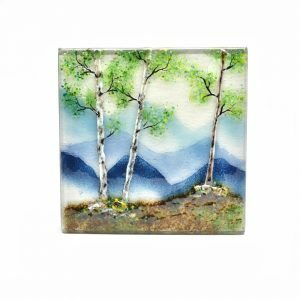 By drawing inspiration from places that I have visited or live within , I use my glass work as a way to creatively interpret the ever present beauty touches my soul. I use light, color, and form to create a sense of place in my work. My hope is that the work will spark a fond memory, and bring a sense of wonder and joy within each viewer. Working out of her studio south of Pensicola, NC in the Cattail Creek community, Amanda Taylor creates various bodies of work that celebrate the natural beauty of the hills and mountains where she has lived and traveled throughout Canada, the United State, and various areas around the world. 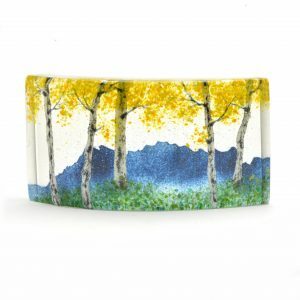 Amanda’s work varies in size, subject matter, and techniques (landscape panels, glass vessels, cast glass forms, etc). She works from her own photographs and/or watercolor paintings to create her landscape series. There is no use of any enamels or paints in her work. Layers of imagery are created by using various forms of glass materials. Each piece is then fired several times in a glass kiln to achieve the final sculptural piece. Amanda Taylor was born and raised close to the Canadian Rockies in Calgary, Alberta, Canada. 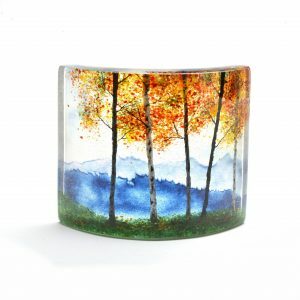 Her love of the outdoors, and photography, inspires her to create unique interpretations in kilnformed glass. Amanda has been working with different forms of art materials and techniques for since her late teens. She has been working in primarily with kilnformed glass since 1994, but has been solely focused on glass since 2007. 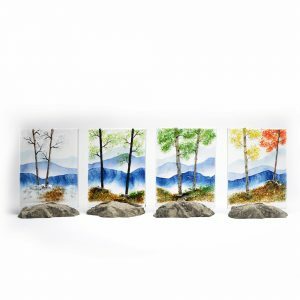 She has studied and been mentored by many glass artists from around the world. Since 2008, her and her husband, Lance Taylor, run a glass studio & teaching facility. Amanda teaches year-round both at the studio and in various studios in Canada and the USA.